If I say “a night at the theatre” you immediately think of an elegant evening dressing code. But in London these two things do not really necessarily pair. Nowadays you see a lot of people, sitting in the audience of a theatre, wearing a shirt and a pair of jeans. As a consequence, you do not have to necessarily pick a posh restaurant for your pre-theatre dinner. And that’s exactly what happened last night. 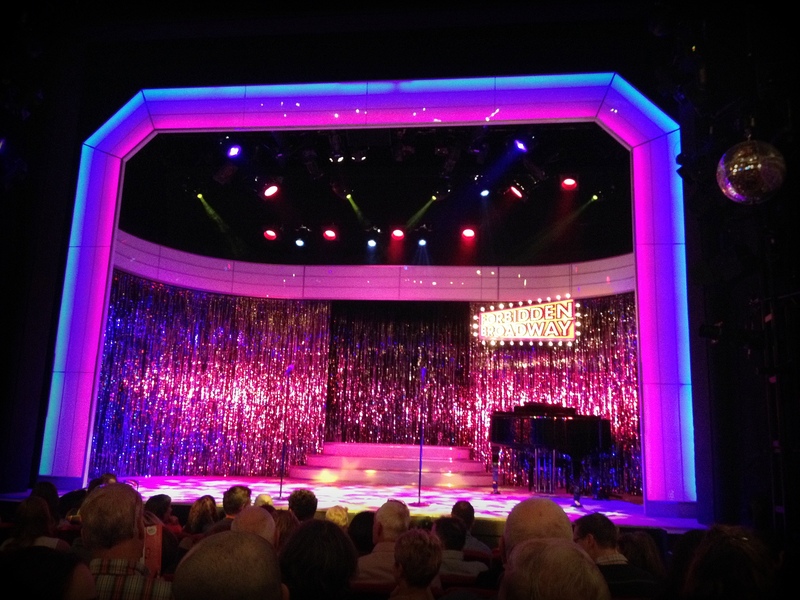 We had tickets for the Forbidden Broadway Musical, at Vaudeville Theatre in London. Polo shirt, smart trousers and brown suede shoes was my outfit for the afternoon shopping in London. Too late to go home and get changed, we headed straight to Charing Cross where the Theatre is, and we to pick a place to have dinner. Among the dozens of places to eat along the Strand, we decided to stop by Byron Burger Club, as it is literally few meters from the theater. 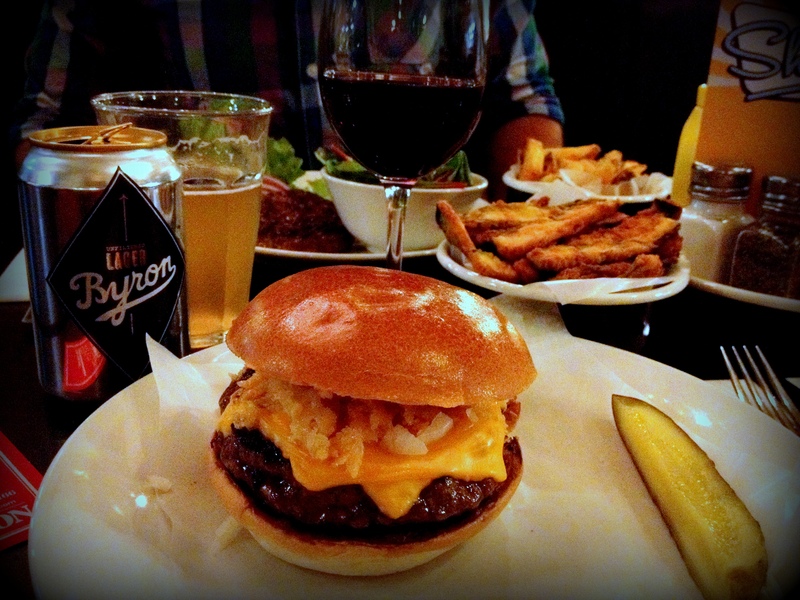 I have eaten at Byron’s in other locations and I was very pleased with the food. But the first thing that caught our attention in this venue, was the venue itself. 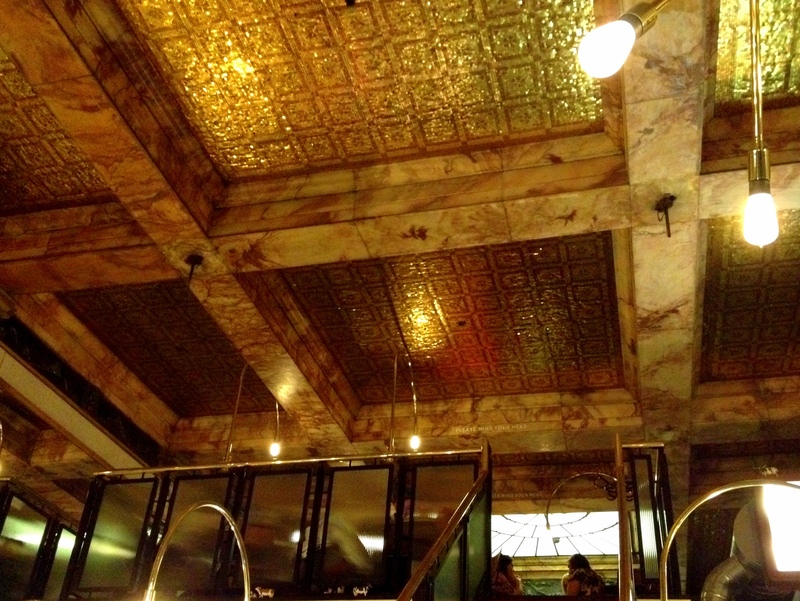 Golden ceiling mirrors everywhere and sumptuous hanging lamps give to the place that classy touch you would not expect from a burger place. It was a perfect start for a pre-theatre dinner. I tried a bite of the skinny burger too. Tasty and nicely cooked, though a burger without bread is like chips without mayo… it does not work. But if you are on a diet mode… it’s still an acceptable compromise. The home-made skin on chips and with the courgette fries on the side were delicious. Golden, crispy on the outside, soft in the inside. Nicely seasoned. That’s all you want when you want a fried side. And the waitresses were so helpful, nice and cheering that the overall experience was really enjoyable. The waitress also asked us about the plans for evening, and when we mentioned the show we were going to see, she said a customer confessed her, earlier that evening, she was going to see our same show for the third time as it is fantastic. And that customer couldn’t have been more right. This version of Forbidden Broadway is a real piece of comedy art. I heard about this musical when looking for the upcoming shows of Christina Bianco, which has recently become popular through YouTube for her vocal impressions of Divas, including Celine Dion, Adele and Liza Minnelli. But Christina Bianco is only one of the four incredible talented artists starring in Forbidden Broadway, together with Ben Lewis and with the West End regulars Anna-Jane Casey and Damian Humbley. Forbidden Broadway is spoof musical parodying musical theatre. It was originally conceived and directed by Gerard Alessandrini in 1982, though this version is completely revised and updated. So it was a nice surprise to see that, together with old musicals like Les Miserables and the Phantom of the Opera, the targets of this show include the latest version of Miss Saigon, Once (a musical inspired by the award-winning movie) and, SUPERFAMOUS, Book of Mormons. Christina Bianco delighted the audience not just with her beautiful soprano voice, but also with her hilarious vocal impressions including Kristin Chenoweth and Bernadette Peters. Anna-Jane Casey brought on stage a loudly funny Liza Minnelli, Angela Lansbury and the “wickedly talented Adele Dazeem” (John Travolta that flobbed Idina Menzel‘s name during the latest Oscars has been inserted in the show!) singing an original version “Defying Gravity” from Wicked. A funny Hugh Jackman/Ben Lewis made genuinely laugh the audience as well as the opening scenes with Damian Humbley as Miss Trunchbull from Matilda. Fresh and witty were the revisited lyrics of “Hallo” and “I believe” from The Book of Mormon by the duo Lewis/Humbley. Outrageously hilarious the spoof of Les Mis, that brought tears of laughter in my eyes. If you have a spare night, grab a ticket and go; and maybe stop by Byron on the way to Vaudeville Theatre, for a full American-inspired evening in London! 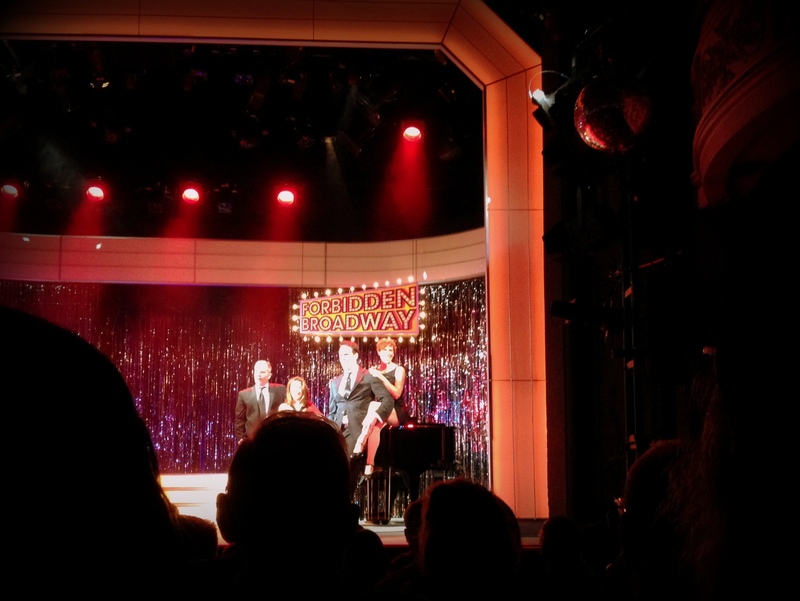 Forbidden Broadway is at Vaudeville Theatre, in London, near Charing Cross, until November 22.